In Wiktionary, to ‘walk the talk’ means ‘to perform actions consistent with one’s claims’. I first came across this term in Reconciliation circles. It implied that if you really wanted to make a difference in the lives of Aboriginal people, then don’t just talk the rhetoric; you have to get off your backside and walk with them in the fight for justice and recognition. To me, it is also important to walk alongside, not in front and not behind. So how do we walk alongside in solidarity with our Indigenous brothers and sisters, when practising social work, a profession which has a history of baggage like removing children from families? This was a question I was trying to answer when I graduated with my Social Work degree. At that time, working with Indigenous people seemed like a daunting task. I remember feeling so inspired and passionate about living out my social work values of human rights and social justice, that I upped and moved my young family from big city life to the remote North. To be honest, it was scarey, I didn’t know where to start and I had no real mentors to show me the way. Like many others, I was thrown in the deep end, flying out to remote communities, with nothing but a listening ear to offer. For two years, I felt like I was in a big bucket of water, with just my mouth sticking out, gasping for air, just surviving. I continually questioned ‘am I doing this right’? Am I making a difference? Or am I contributing to the problem? Most of us come with good intentions, bringing all of our head, heart and hand to the work, but how do we do it in a way that is decolonising and authentic. What does best practice social work in Australia’s indigenous communities actually look like on the ground? ‘Talk the Walk’ will feature interviews with those who have trod a well-known path. This is the question I hope to explore in a new podcast, I’ll be developing and launching in the coming months. Don’t throw out your textbooks, but I believe there is real value in hearing stories of experience, straight from the mouths of those covered in dirt, sweat and dust. “Talk the Walk” will feature interviews with those working in the field as well as traditional voices with words of wisdom for the whitefellas in white Toyotas. My hope is that “Talk the Walk” will be a valuable resource for graduating social work students preparing for the journey ahead, and a watering hole for the rest of us who continue to learn every day! If you or someone you know would make a great interview, please drop me a line through our Contact Us page. They could be a social worker, community development worker, counsellor or other allied health professional, or an Elder or Indigenous community member. Yes, I can see the irony here. A podcast is all about talking. So my thinking is that, the podcast is a learning tool to help all of us get off our butts and do the walking. So if you know how to walk the talk, tell me your story. Let’s ‘Talk the Walk’ together. It’s scary out there but you can show new social workers the way! Curiously, I recently searched the web to see how many Australian social workers have a personal blog about their journey. Disappointingly, there are not a lot of us out there! Thankfully, there are loads more academic texts and journal articles around these days on Indigenous social work. But my vision was to offer a space for graduating students to connect and prepare for their journey through stories. As well as a go to resource for the rest of us who continue to learn every day! So here are my 7 reasons why you should start a blog. Remember when you first started studying social work because you wanted to make a real difference to people’s lives? Well, having your own blog is one way of teaching others about what works and how to avoid making the mistakes you made. You will be shaping and mentoring the next generation of social workers. You will be surprised at the wide range of people that will benefit from reading your stuff. Not just senior social workers, but nurses, occupational therapists, speech pathologists, youth workers and even entrepreneurs. Some of these people don’t ‘get’ what it is we do. Now you can show them. Social work in Indigenous communities is bloody hard sometimes. Newcomers need to hear that! We need people who are prepared to walk the talk, take the knocks and pick themselves back up, accept they are not going to change the world and be content to take the small wins. So we have to tell it like it is. I have seen too many people come to remote Australia expecting to change the world, only to leave feeling helpless because they had no idea what to expect. Whatever field you practice in, there is a lot of work to be done and you can help prepare newbies. OK, so entrenched social problems arising from a history of colonising practices in Australia make this one of the most challenging fields of work. But it also comes with a-m-a-z-i-n-g rewards and once-in-a-lifetime experiences, if workers have the patience and perseverance to stick around long enough to see it. With stories about the people you meet, the places you go and the successes you have, you can inspire them. Some people just want to know what ‘A Day in the Life of a Remote Social Worker’ actually looks like. You can’t get that from reading a journal article or text book. Stories of lived experience can teach others about the pitfalls, the challenges, the rewards, the tips and the strategies for surviving and thriving. Blogs are authentic and practical – real world stuff! Writing a journal article takes a lot of time and is a highly scrutinised process. I just wanted to get my ideas, my opinions and my experiences out there. You can write about a current issue and hit publish today. You can start a conversation, mobilise a mob and get immediate feedback. How powerful is that! 7. You can earn PD points. Having a blog is another alternative for reflecting on your practice with yourself initially (like when you’re staying out bush and you’ve got nothing else to do) and then with all your followers who hopefully send comments. Even the AASW recognises the value of social workers sharing their perspective and contributing to the growth of the profession. Go to Category 3 ‘Professional Identity’ to claim PD points for ‘Presenting or Promoting the Social Work Perspective’ and claim the hours you have taken to write your piece. Bonus! So if this has convinced you that blogging is a good thing, go for it. There is lots of information out there about how to get started. Please drop us a line if you do. I, for one, would love to be the first to read it (and comment). These are the words of Miriam-Rose Ungurmurr first uttered in 1998 during the Pope’s visit to Australia and echoing in my mind on recent occasions. Last weekend I had an opportunity to experience first hand, how it is we can tune into our true selves through the process of Dadirri. With other like-minded people, we gathered under the big shady tree overlooking the community oval at Daly River. Miriam-Rose was there, as this is her home. Also holding us in this space, was Judy Atkinson, another wise Indigenous soul, known for her trauma-informed work with communities. My interest in attending this gathering is mostly about how I, as a non-Indigenous woman can walk alongside my Indigenous brothers and sisters on their healing journeys. I have a strong sense of ‘we’re in this together’. Miriam was quick to point out that dadirri is not just an Aboriginal thing. It’s just that White fellas have not been given an opportunity to practice it. There is certainly a lot being written in the Western world at the moment on mindfulness meditation and this is probably the closest thing there is to understanding the practice of dadirri. Judy says mindful practice is “being put up as the mantra as the response to trauma”. Dadirri goes deeper. It goes to the heart of what it means to be connected spiritually to the country, being in nature and listening to the rhythm of the land. While I won’t ever fully understand Aboriginal people’s unique sense of belonging, Miriam gave us some clues as to how this comes to be. She asks us to sit in quiet still awareness and contemplate ‘Who are you’ and ‘how do you know who you are?’ This requires further and deeper reflection. Who are you with? Who are you connected to? Who are your ancestors? Where did your ancestors journey from to allow you to be in this place at this time? This is something every human being can come to know if you find the stories and listen intentionally. It is like finding and listening with purpose to the spring that is bubbling within each of us, a source of energy, of answers to life’s questions. I couldn’t help but imagine that for someone who has experienced the effects of intergenerational trauma, this could be quite confronting. Consider adult children who were removed from their families and don’t know who their family is, their language or their country. This spring may be full of tears – a well too deep to access. For me in my white skin, going within, is much less threatening. For I have had a privileged, safe and nurturing upbringing. I sometimes feel overwhelmed with the level of despair, self destruction and pain amongst Aboriginal families and communities. The science of epigenetics tells us that trauma is now altering the genetic material of children being born today. And so even if the trauma did stop now (which it isn’t – families are still having their children removed from them at greater rates) how does one begin to even start the process of healing? I saw this despair on the face of an Aboriginal woman in our gathering whose heart was crying out for help for the fifth generation of children being sexually abused in her community. Can healing begin when the trauma is still happening? Judy’s reflection advocated that becoming mindful and knowing who we truly are, allows us to have a clearer vision on how we can change the systems of injustice. Judy’s notion of ‘community of care’ is like the tree we sit under that is connected underground through root systems to other trees. These roots, although unseen are continuously connected through strong kinship systems and culture. Not even a bushfire can destroy 40,000 years of these connections. Miriam went on to offer a reflection on the Pope’s words. There was a sense of hope restored in the group. 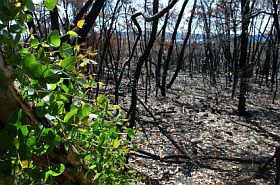 Even though bushfire after devastating bushfire sweeps through the land, scorching the trees, this is always followed by refreshing wet season rains, new leaves, new growth. Miriam says it’s a natural thing for trees to drop their leaves and the growth always comes back. Her people always cry in excitement when the first rains arrive. They cry for the people that have passed away in the previous year and their tears wash the bad things away. The plants, the trees, the land is cleansed. A new season is starting. Hope returns. So here were Miriam’s final words to us. ‘The person you are now, is it really who you are? Is this your true spirit doing what you’re doing now? Is there something in you, that is really you? If so, use this gift to help others. Believe in yourself. There is only one of you. You are special. ‘There are always dreams dreaming us’ says Judy. The practice of dadirri helps me to tune in to my purpose in being here. I am not the firefighter. I am the ranger burning off and establishing fire breaks. With more rangers in the world working from a harm prevention framework, we can minimise the number of devastating bushfires, knowing that nature will always be there to heal, regenerate and restore. Shock. Disbelief. Disgust. Anger. Sadness. Despair. I have been through the whole gammit of emotions this week. So if this is how I have been feeling, how must my Indigenous brothers and sisters be feeling in Australia right now? I cannot let this week pass without saying something about what I have been feeling and thinking as Aboriginal people around Australia are forced into a position of protest (yet again). You would have seen it. You couldn’t escape it. Images of an Aboriginal boy shackled to a chair at the hands and feet, a spithood over his head. And surrounded by four guards in Don Dale Junenile Detention Facility (or hellhole as it has recently been referred to). It is the worst kind of child abuse I have ever seen captured on camera, delivered at the hands of guards whose duty is to uphold some form of justice! Images of torture and trauma in the NT Juvenile Justice system have sent shockwaves across the country resulting in uproar from every section of society. Thankfully this uproar is a sign that as a country we do care. There are some of us that haven’t lost our humanity, despite the actions of our Territory Government who have brainwashed us into thinking otherwise with rhetoric about tough love, punishment and needing to come down hard of criminals. This action by our criminal justice system has well and truly crossed the line. I simply cannot fathom what it must be like to be a child in juvenile detention, being locked into solitary confinement in a cell barely bigger than my bathroom, having to eat with my hands and experiencing violent abuse at the hands of those that are supposed to be much wiser than me. It brings me to tears whenever I think about it. What annoys me most of all is the ignorance of those who choose to comment on social media about ‘bad children who are getting the treatment they deserve’. I couldn’t read the comments myself as it would only make my blood boil. But I hear about them. The fact is no-one ever deserves to be treated this way in a justice system, no matter what they have done. That is why we have the UN Declaration of Human Rights. These are children for god’s sake. Juvenile justice is our one opportunity to show a better way, to put our kids on the right path. It is highly likely these youth have experienced a lifetime of trauma starting in the first 1000 years of their life. The last thing they need is an infliction of further trauma. By the time adolescence rolls around, this is final intervention point to alter the neurological makeup of this child heading into adulthood. To reprogram their subcortical structures into one of empathy and love, rather than the one of violence and destruction they have been programmed for. This morning, I attended a rally in Darwin about the NT Justice System and how it is inflicting cruelty on our young people, 97% of whom are Aboriginal. Since the day of Invasion, we continue to punish and inflict pain onto those who are the most marginalised in our society. These youth are the latest victims of years of intergenerational trauma. John B Lawrence is a barrister in Darwin and has represented many young people who have been the victim of inhumane treatment at Don Dale. His words at the rally were powerful and angry. Please take time to listen to some of his speech below. It is people like this standing up, speaking out and taking action, that will help in some way to start to heal the wounds of this dreadful week. Hopefuly the events of this week inspire you to action. If we want this Royal Commission to be a fair one it must have a totally independent Commissioner at the helm, not the one that has been appointed. You can make a real difference by putting your concerns in writing and sending them to Malcolm Turnbull here. You might want to address the following concerns raised by the rally this morning as follows. On a final note, it is easy for a sense of hopelessness to take over in weeks like this. I have found it useful to retreat into the healing peace of music. Today I’ve been playing Spirit Bird by Xavier Rudd. Enjoy.